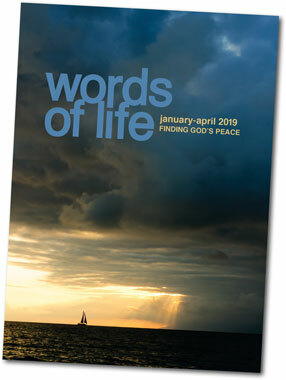 Written by Major Beverly Ivany, Words of Life is The Salvation Army's daily Bible reading notes series. Many use Words of Life in private devotional times, but there are other ways it is used. For instance in Danbury, Connecticut, USA, Captain Iris Torres gathers people around a table for coffee and a reading from Words of Life. She then translates it into Spanish and prays for the people before distributing bread and Bibles in English and Spanish. By offering God’s Word, the captain offers something lasting. ‘As the rain and the snow come down from heaven, and do not return to it without watering the earth and making it bud and flourish, so that it yields seed for the sower and bread for the eater, so is my word that goes out from my mouth: it will not return to me empty, but will accomplish what I desire and achieve the purpose for which I sent it’ (Isaiah 55:10,11). Find out what is on offer in our devotional series by exploring these extracts. May God’s blessing and peace be yours as you commence this brand new year! Whether you are a regular reader of this devotional book or not, I am so pleased you have chosen it to be part of your daily life – praying God will enrich you, and that you will be fully aware of his presence with you as you read from his Word. We all long for world peace. Peace in our countries and communities. Peace in our homes. And, yes, peace deep within us. But sometimes peace is hard to find. So, in this edition we are looking at ‘finding God’s peace’ within all circumstances – for God is present with us wherever we are. In the Old Testament we take a glimpse into the life of Abraham: a man of great faith who seemed to find peace with his God – no matter what he faced. We also explore the Book of Leviticus to see how peace can be found by living a holy life. In Deuteronomy we find Moses continuing to share with his people things that were necessary for living at peace with others. Then we will discover together how, in the Book of Judges, some leaders found peace while others – who turned their backs on God – did not. For two days each week we read of some amazing people of God and how they found – or didn’t find! – peace within, according to their actions. From Adam to people in New Testament times, those who depended upon God knew peace was theirs. Most weekends we again look at a psalm or proverb and share a hymn or Christian song together. For the Easter series our guest writer is Lieut-Colonel Christina Jeppsson, the Territorial Commander in Denmark. And so, as we read through Words of Life together, may God’s peace be ours. May he grant to us a peace within our soul that perhaps we have never experienced before – knowing he is with us and goes before us, always. God has something special for each of us in 2019. Do you believe it? My sincere prayer is that it will be so for every reader! God bless you abundantly, and may his face shine upon you in these days. I pray this in the name of the Father, Son and Holy Spirit. Amen. ‘I will make you into a great nation and I will bless you; I will make your name great’ (v 2). The LORD had said to Abram, ‘Leave your country, your people and your father’s household and go to the land I will show you’ (v 1). So Abram left, as the LORD had told him ... Abram was seventy-five years old when he set out from Haran (v 4). ‘I will bless those who bless you ... all peoples on earth will be blessed through you’ (v 3). Abram stepped out in faith, trusting God completely. As we step into a new year, is God calling us to something? Perhaps something out of the ordinary? It might be to do something big; yet it might be quite a simple thing. Are we listening? Are we willing and ready to respond? Lord, help me to step out in faith – for whatever is ahead.